Julia E. Babb. Nov. 12, 2011. Julia Elizabeth Babb is a self-mythologizing Performanceusse and Conceptual Artist. On a polizontal Search and Create Mission from Inner Space, Julia employs whatever methods, means and materials are at hand—but mostly calligraphy, a pack of lies and a rubber face—she boldly rushes in where devils fear to tread. Part mad scientist, part Monk of the Enthusiastical Order, her ultimate aim is to delight and surprise audiences by drawing unseemly parallels between emotion and HVAC, Quantum physics and ritual, Dragon taming and her job at the Mobius strip factory; all while making a HUGE fool of herself in public. 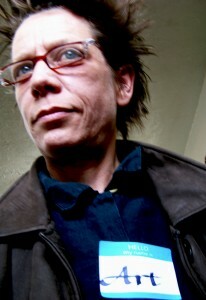 In 2009 Julia received a Jerome Grant for the “Naked Stages” Emerging Performance Artist Program through Intermedia Arts, and hosted by Pillsbury House Theater. In this program, she wrote and performed her first solo show titled “A Fool’s Paradox” in April of 2010. Lisa Brimmer. Nov. 12, 2011.